The report has a lot of data & examples. You can skip certain parts if you are not interested in data – but read each & every line about the ideas & ready to execute plans that we shared in the report. I started working on building a SaaS product for educational institutes in 2013. We started selling product by end of the year and converted initial customers. When I pitched to investors for funding in 2014, do you know what was the first question they asked? How big is the market size? I don’t know what does that mean. I said it’s a huge market. Thousands of schools, colleges and coaching centres in the world. The investor smiled. He could sense that I am a novice. He helped me understand what is Total Addressable Market and Target Market. He suggested me to complete my research and pitch again when I have more clarity about the numbers. Ever since I do my research before talking about ideas & potential of profits in any market. Health and fitness is a steady growing segment of the $4.2 trillion global wellness economy 2017. The wellness economy grew by 12.8% over 2015. The Global Wellness Institute (US) in its “2018 Global Wellness Economy Monitor” Report categorizes ten different segments which sum up the Global Wellness Economy. Let me share the details of top 3 segments which can be easily captured through online businesses. The largest contributor to the Global Wellness Economy (2017) was the “Personal care, beauty and anti-aging” with a market size of $1082.9 billion and growing at an average annual growth rate of 4.1% over 2015. Figure wise – With a market size of $702.1 billion the “Healthy eating, nutrition and weight loss” is the second largest contributor to the global wellness economy. The market size of which grew from $647.8 billion in 2015 to $702.1 billion in 2017 at a healthy average annual growth rate of 4.1%. Which shows the paradigm shift in the views of people regarding health. Now, balanced healthy eating, proper nutrition and trying for an optimum weight is no more of a luxury restricted to uber class but a necessity for the masses. The market size of “Fitness & Mind-body” grew from $542 billion in 2015 to $595.4 billion in 2017 at an average annual growth rate of 4.8%. All of which indicates the increased awareness, wellness mindset of the people and solutions they are constantly looking for. If you are into brick & mortar business then you must analyze the segments like Preventive and personalized medicine and public health; Spa economy; Thermal/mineral springs; Traditional and complementary medicine; Wellness real estate; Wellness tourism; and Workplace wellness. The Google trend of the last 5 years for ‘Health’ also reflects a steady and healthy data. That’s why we have so much confidence that a profitable online business can be built in the health industry, no matter in which country you are, no matter which sub-niche you choose within the health segments. Let’s quickly look at the valuation of some of the startups in the Health Industry. Founded in 2012, Peloton brings in a new concept to fitness by developing sophisticated technology embedded in fitness equipment to make it more engaging and digital, primarily a cycle/bike or tread. Peloton provides a world-class digital cycling studio, tread experience in a comfortable home location at the chosen time. Hence, making fitness an effective & engaging experience. ClassPass is a subscription marketplace for individual and well as corporate members. Class Pass mission is to “Motivate people to lead inspired lives every day by introducing and seamlessly connecting them to soul nurturing experiences”. The app and website based startup help users find and book various fitness classes including yoga, cycling, Pilates, barre, running, strength training, and dance. It has over 8500 partners spread across 49 cities worldwide but most of the partners located in the United States. Class Pass also has a community to support members and believes- that being active is the key to living a happy and healthy life. Flywheel Sports was created by Ruth Zukerman with a simple idea of making indoor cycling an epic, immersive experience for riders who wanted more. Ruth Zukerman and his team at Flywheel Sports developed not only the bike but also an indoor cycling workout which allowed every fitness enthusiast to deliver a high-intensity cardio workout in a fun filled energetic atmosphere. The Flywheel Sports has a growing FLY Fam community of over half-million athletes and has a range of bikes, gears, and apparels to shop for. Further CureFit offers healthy and nutritious eating options tailored to you through eat.fit. Various meditation and yoga techniques focused on the mental well being via mind.fit and healthcare consultations/ solutions through care.fit. Ethan Agarwal’s quest for an audio-based fitness guide led to the creation of Aaptiv- now a top audio based fitness app on the Apple Store. Ethan’s vision is simple: “To improve the lives of millions through fitness through innovative use of sound”. Which begins with the combination of effective programming, empathetic trainers, and uplifting music. Aaptiv delivers on-demand over 2500 audio guided workouts and structured programs designed by certified trainers for fitness, body strength, and healthy living. I myself failed at my initial startup attempt and lost more than $10,000. You can raise millions of funding in a startup but that’s a different ball game. And most of the startups fail even after raising funding. It’s not that the market is bad but there could be ten other factors that contribute to the success of a startup. You can stay small but profitable. You can earn more than what you can spend in your lifetime. You can become financially free even with a small blog, e-commerce store or affiliate marketing business. Let me show you the other side of doing a profitable business in the Health & Fitness Industry. Being a NicheBlogger you can develop web assets with unique health & fitness messages. You can grow your website and sell on the marketplaces like Flippa. Here are five quality websites sold on Flippa during the past one year related to health and fitness niche. Vegetarian bodybuilding website was from Chris Willitts. Chris is passionate about reshaping bodybuilding into a healthier lifestyle and the vegan message he carried on his site. He is also a creator of V3 Bodybuilding nutrition program. Through vegetarian bodybuilding, he solved the pain points concerning How/Would of gaining enough protein while on plant-based fitness system; gaining strength while avoiding meat; concerns about carbs and how to stick with it long term. The blog was started by Chris in 2013 on WordPress platform and he was making $1680 per month at the time of selling website in 2018. The blog has a unique content & design attracting 84,167 page views with 22,465 unique visitors. Most of which (75%) being organic searches, the highest being from the United States. The healthy homestead is a blog on health, food, fitness, weight loss and a bit on health effects of essential oils. The mission of which was “to find, gather and share the best and, actionable health, nutrition, and fitness information” to the readers. The blog was started by Nikola in 2015 on WordPress platform. The last reported profit was $1026 per month when sold on Flippa in 2018. Healthy homestead has a traffic stats of 94,769 page views per month. 81% of the pageviews were from the United States. Sebastien de Bandt’s blog “Happy body formula” has a goal to make your body happy. The team behind the scene is passionate about real food and healthy living. The website has quality articles on nutrition, health & wellness and is a hub for healthy recipes and wellness tips. The blog was making $297 per month when it was sold in 2017. The happy body formula was started in 2015. Happy body formula attracts page views prominently from the US mostly through organic search (42%) and social channels (34%). The traffic stats being 56,204 unique visits and total page views of 177,231 per month. The New testosterone is an affiliate site focused on supplements and fitness. The blog was started by Evan in 2014 and sold in 2018. It was making $570 per month at the time of sale. The 4-year-old website had traffic of 15,020 page views with 10,524 unique visits mostly from the US through organic search(88%). The traffic was not much but yet it was making decent money, which means affiliate marketing is the most profitable way to monetise the blogs. The blogs list various training for all body parts. The content was focused on supplements, motivation and female fitness. The blog was started in 2004 with unique content and was sold for $9,500 in June 2018. I think they left a huge opportunity to make profits from the niche. 3-year-old websites were making huge profits in the niche and definitely, they could have done better. The revenue figures were not made available on Flippa by the blog owner. During our research – we stumble up on some of the gems (sub-niche) aligned with the latest trend going in the industry. For simplicity, we divided those into 6 Sub-Niches and you can pick a super niche (micro-niche) within that to start with. Weight loss niche can be focused on Women, Men or Both. You can find multiple angles to start a blog related to weight loss. 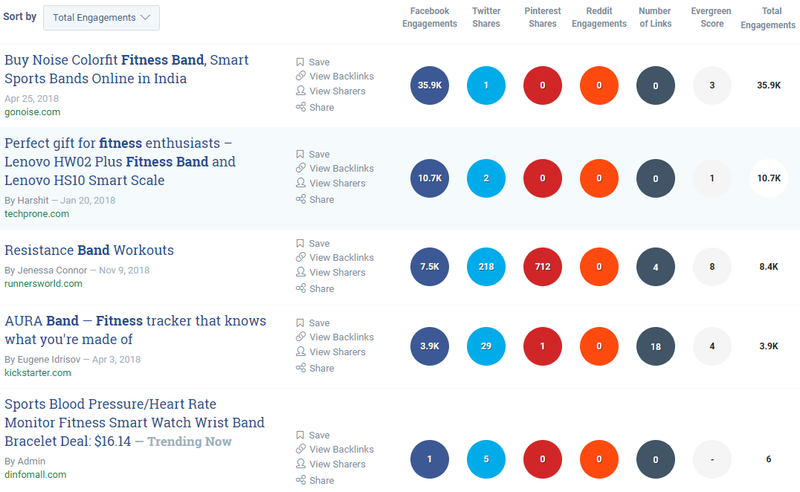 Look at the engagement on the content related to weight loss. A lot of queries revolve around specific diet for acquiring fitness & strength, diets supporting Illness and recovery. Even an idea of a vegan diet focused on growing children, during pregnancy, and for elders can be a good micro-niche. Start a blog related to any of the food/supplement. There are numerous gadgets for monitoring, measuring, storing and sharing of various body stats and vitals. Start something related to activity tracker, fitness band or smart watches. People search for the latest training to get the desired fitness results. You would not go wrong if you start something in following micro niches. An essential part of most of the workouts and exercises, knowledge of various equipment can come in handy for the beginners and intermediate level fitness seekers. A good affiliate blog can be built around the equipment used. This may seem a bit off topic but being able to live life stress-free and enjoy a good psychological state in a fast-paced life is becoming health challenges. There could be many more ideas but we have shared minimum possible information so that you can take a clue for building a profitable niche blog. I won’t leave you alone with the niche ideas only. I would walk with you till you get an absolutely executable content plan for your profitable niche blogging business. No matter which sub-niche you pick today, following tips would help you get sufficient content ideas to start your blog right away. If you are a beginner level writer then read this in-depth practical guide on writing great content that gets shared by your audience. If you have read the in-depth practical guide on writing great content that I just mentioned then you would have understood the importance of your audience. The best way to capture ideas from your target readers is to engage with them in the discussion groups. Join relevant groups on Facebook, LinkedIn and Niche Forums. Participate in the discussions on Reddit & Quora. You would not only learn how to write but also learn about the pain points of your readers. Once you have traffic on your blog, then you can take ideas from the blog comments & email replies of your readers. Keyword research is the holy grail of affiliate marketers and niche bloggers. You don’t have to be an SEO expert to do keyword research. And follow this guide to do keyword research like a Pro Blogger even if you have not heard about keywords in your life before. Don’t leave any opportunity whenever there is any turn in the industry. Keep the track of latest food trends, technology trends, latest workouts or even the equipment. Look out for the news, reports and the publications to find out the buzzwords in the industry and find your content. 5 best wearable technology for the fitness freak. Paleo Vs Keto, which is best for you? 30 minutes full body workout plans for awesome 40. It’s challenging to start and scale a blogging business without your own involvement. You may not be the expert but you should be passionate to learn. Otherwise, you may get bored to death after a few months and leave the blog unbaked. Most of the bloggers fail to make money because they leave blogging efforts too soon. Don’t be that person. Keep doing the efforts even at a slow pace. Build your expertise and share the content from your own personal experience. For example, you help people with a diet plan for muscle building or help plan a routine for the new Gym joinee. That’s your expertise, it might be a routine for you. Your monetisation would depend only & only one factor – User Intent. User Intent is the most important factor for the success of the business yet most of the bloggers ignore. If your reader is coming just to read the information then Display Ads & Sponsored Posts would perform best. If your reader is looking to buy a product right away then Affiliate Marketing & Dropshipping would work. If you can capture their emails for re-engagement then you may sell them e-books, courses, products and workshops. Google AdSense is a program that allows publishers, websites, bloggers to serve their audience automatic text, image, video, or interactive media advertisements. The advertisements are administered, sorted, and maintained by Google. Once you have clear understanding of your audience and their needs, you can start selling ebooks. BBG Books and guides by Kayla Itsines. A training program or offering which can be Personalized or a Group Coaching. Nutritional Coaching by McKel Hill. You can get recurring income from memberships. Analyze some examples below. SWEAT Membership for BBG by Kayla Itsines. Sweat4 health forum by Scooby Werkstatt. E-commerce is the prominent monetizing method with decent sites being. If I have to start a new website in health & fitness then I would start testing monetisation with affiliate marketing. I can share some product ideas with you that you can use while planning your content. You would be surprised to see that tons of products (digital & physical) are available to promote in health & wellness industry for affiliate commission. You can sell accessories, training gears, books, supplements and training programs to earn a decent passive income. You can easily find grocery and kitchen staples on Amazon or any other e-commerce seller with an affiliate program. This can range from fitness equipment, workout essentials to kitchen equipment and appliances for health and well being. Health supplements earn most of the money for niche websites in weight loss, weight gain and muscle building niche. This is mainly cloth lines, shoes and other wearable suited for a workout or assists in performing an exercise. While you still feel lazy to develop your own training program, you can advocate the best of the fitness programs, coaching and the classes. Expert Blogger Tip: Promote only those products and programs that you have used personally or you are sure that it’s beneficial for your audience. Don’t lose the trust for the sake of money. Well, we have spent more than 100+ hours in the research and curation of this information for you. Initially I was planning to release this niche report in our paid membership group (Inner Circle 2.0) but then we decided to make this report available for everyone. Final editing itself took more than 7 hours. I have to divide the niche report into two parts because of the length & depth. and also reveal the email address of health blogs those accept guest posts. I have not done that even in my paid courses because of lack of time. But now I am committed to releasing the niche reports & all the steps to grow niche blogs. We want to see you becoming a successful Niche Blogger. If you like our work, kindly help us spread the word. Please share the article link on social media where you are most active. That way you can payback if you have received any value from the content. Let me know in comments, what you are feeling right now. Great post Sir, bookmarked it. Waiting for 2nd part. How GDPR works on Health Related Niches. GDPR is not any industry specific. It will work on health niche similar to any other niche. If you write genuine content then Google boss would love you. Health is nearly a 2.5 Trillion $ market, such a huge market to capture wealth. Your advice in this part is surely going to help make my fitness community more stronger. I am a part of your paid inner circle and reading this actually gave me a feeling that, “This should have been for the paid ones” Ha ha. A bit of selfish me. But I am happy that you have opened it for all, it really gives everyone a chance to start and make passive income with their loved niche. Awaiting for the next part. Initial plan was to make it available for the paid members only, but then we changed our mind. All the premium content would be freely available to everyone. Thank you so much for this In-depth Information, as I have already started a blog on Health and Fitness, reading this has certainly given me a broader perspective of what I can do in this niche. An idiosyncratic superlative piece of information, indeed. Well, it would be great if you could walk us through the “well in demand” niche; how to make money online? Thanks for the unfeigned courtesy and ungrudging support. Bye till we talk again. Wow! This post is such an eye opener. Just bookmarked this blog. Will checking back every now and then for more valuable information.